Rugs are a necessary fixture in the decoration of any house. Selection from various designs and types of rugs for dining, living, kitchen, bedroom, hallways and bathrooms may take a lot of time and difficulty. What many people overlook are the bathroom rugs and their necessity in a home. If you are looking forward to adding bright colors and warm moods to your bathroom, then a bathroom rug can do just that. Having a multicolored and bright rug that is luxurious, comfortable and soft placed in a bathroom can definitely brighten up anybody’s day. For each bathroom in the house, you can use imagination and blend it with your décor. For kids’ bathrooms, there are plenty of rugs and mats in the market that are especially designed to attract kids’ attention. Bathroom rugs not only provide an aesthetic feeling but also add comfort and warmth to the entire area. Various serious accidents are caused by slipping in bathrooms while getting in or out of shower. Tragic accidents can be easily prevented if people start using bathroom rugs for their homes more often. Investing your money in buying bathroom rugs is definitely a great and pro-safety idea for any household. 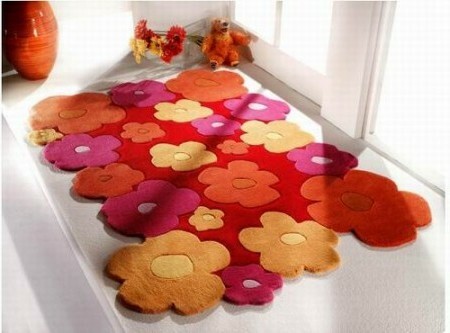 Bathroom rugs and mats come in various styles, patterns, sizes, colors, materials and shapes. If you reside in a single bedroom apartment with 1 bathroom only, having 3-4 sets of simple black and white, bold and abstract designed rugs to match your bathroom décor is a great idea. You can also match other accessories like towels, shower curtains or mirror frames too. The plus point of having multiple rug sets is that you can change the set every time they get dirty and replace it with another one until they are washed and cleaned. While you are selecting the perfect rug for your bathroom, you must consider buying eco-friendly mats or rugs, commonly known as ‘green rugs’, which are made from organic and natural fibers. Also, you should select the rugs that have non-sliding back material with slightly curved edges or those that are reversible for multiple reasons including durability and safety. The most important factor that you should pay attention to while getting a new bathroom rug is that it should be water resistant. If you are buying a bathroom rug for the first time, try buying the one that is made of sisal and cotton combination fiber or chenille-made mats and rugs. And when it comes to design and shape of bathroom rug, you should first measure how much space your bathroom can spare for a rug and then select accordingly. In order to give your bathroom a more exquisite look, buy a rug set which includes matching toilet seat and top cover also. Take some time out from your busy schedule and find yourself just the right bathroom rug set today. You will be glad you did not only for decoration, but for safety reasons as well.